Supporters of women bishops in the Church of England have hailed the latest General Synod vote but warned against further changes to the plan. A leading campaigner regretted the Archbishop of Canterbury's remark that "some bits of fine tuning" were needed. The Church's ruling body said the House of Bishops could make some amendments to the law before a final vote in July. One opponent of women bishops said that if nothing was changed before then there would be a "train crash". When the final vote on creating female bishops is held in July, the proposed law will require two-thirds majorities. The legislation as it stands would allow traditionalist parishes to have the right of access to an alternative male bishop appointed by a woman diocesan bishop. Opponents of women bishops fear that this means the alternative bishop would derive their authority from the woman bishop. An amendment before the synod on Wednesday aimed to define the alternative bishops' authority in such a way that it did not derive from that of the woman diocesan bishop. Supporters of women bishops reject such a move, saying it will mean the woman bishop did not have full authority in her own diocese. The amendment, moved by Manchester diocese, was rejected by the synod, but it did allow for the House of Bishops to amend the legislation further. Only the House of Bishops, which meets in May, has the authority to amend the legislation now. In July the General Synod must either accept or reject the law without further amendment. 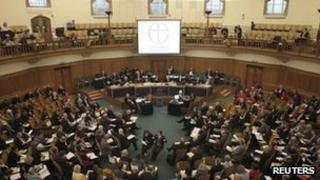 The synod said any changes made by the House of Bishops should not be "substantial". Synod members were earlier told by the Archbishop of Canterbury, Rowan Williams: "I think... we have a very high degree of clarity about the basic principles here. I think we have the possibility of some bits of fine-tuning that will take us a little bit further." Father Simon Killwick is leader of the Catholic group on the General Synod, representing one of the two schools of opinion in the Church which oppose women bishops. He told the BBC News website it was disappointing that the amendment was not passed, but added that the decision "does allow some room for manoeuvre" by the House of Bishops. He wanted to see if something could be done "that would improve the position for traditionalists". "If nothing is changed between now and July then it will be a train crash, whichever way the vote goes," he added. "If it passes it will be a train crash because the conservative Evangelicals and Catholics will feel alienated to say the least, but if it doesn't pass then supporters of women bishops will be very angry." "It's probably a matter of finding a form of words around which everybody can unite" on how to share out the jurisdiction of the diocesan bishop and the supplementary bishop, he added. The Reverend Rod Thomas is chairman of Reform, the leading Evangelical group opposed to women bishops, and he said he was also encouraged by some of what had happened in Wednesday's debate. "One of the things that we went into the debate not knowing was whether there was any willingness on the part of the House of Bishops to do anything to the legislation," he said. But a number of bishops, including those who did not want to see much amendment, accepted "that they had to do something". Evangelicals needed to be able to answer critics who say "For all that you say about male headship you've accepted a bishop with the authority of this woman", said Mr Thomas. Archbishop Williams had drawn a distinction between derived authority and delegated authority which could be very useful to achieve this, he went on. "And I think so long as you can do that with integrity then I think we can live together on this. We just need to get the theology clear. "I'm optimistic it's still possible; whether it will happen or not I'm not sure." Hilary Cotton leads the campaign for the women bishops legislation in the group Women and the Church (Watch). "We are very glad that they had a full and proper debate and decided that that was not the way they wanted to go," she told the BBC News website about the rejection of the amendment. But "our pleasure yesterday that we achieved what we wanted to was tempered by what the Archbishop of Canterbury said in the morning, making it clear that there is still a discussion to be had in the House of Bishops." Her campaign wanted the legislation to go forward to July's vote unamended, as the Church's 44 diocesan synods had endorsed it, she said. "It lies within the House of Bishops to decided what the future of this legislation is and we've complained about that, not because they won't make good decisions but because it's all men." However, she said, "We know that the vast majority of the House of Bishops want women bishops and they want it in the way that this legislation says." She did not know if an acceptable form of words on the authority of the diocesan and supplementary bishops could be found. But it would have to satisfy enough of all three Houses of the General Synod for the law to be passed in July. "If they do change it then they would have to find some way of checking that it will be supported... or else the whole law might be lost. "I think if it doesn't go through in July there will be a quiet haemorrhaging away of women from the Church - and of men who can't understand this either. It's not right for the Church not to have women in leadership, and they will find it too uncomfortable to stay." There have been suggestions that if the legislation is passed in its present form more Anglo-Catholics will leave the Church to join the Roman Catholic Ordinariate, while some conservative Evangelicals may seek to align themselves more with conservative Anglican leaders in Africa and elsewhere. But Ms Cotton said suitable arrangements had been worked out where women had become bishops overseas, and whether the law were changed or not the same men would be named as alternative bishops.